Update (November 2017): Unfortunately, Facebook has deprecated Comment Mirroring and it is no longer possible to use this feature: https://developers.facebook.com/blog/post/2017/11/07/changes-developer-offerings/. We recently migrated a client to Facebook comments and enabled Comment Mirroring. Though the process is simple, it’s poorly documented and a little finicky. Here's a rundown! In the left-hand sidebar, click "About"
Beside the "Category" text, click "Edit"
Remove the existing category tags and add "App Page"
In the left-hand sidebar, click "Settings"
A new option called "Advanced" will appear under the "Settings" button you just clicked. Click on it. Scroll down to "App Page" and select your Facebook Page from the drop-down list. You can now go back to your Facebook Page and change the category tags to whatever you want. Scrape the specified og:url and create a new URL object based on the contents of that page. If og:url is already associated with a URL object, use that object’s cached data instead. The cached data for any URL object is publicly visible via the Graph API: https://graph.facebook.com/<URL>. Associate the comments on this page with the specified fb:app_id so they inherit the correct Comment Mirroring and comment moderation options. These options can be configured at: https://developers.facebook.com/tools/comments/<APPID>. Create a new Facebook comment box and display all of the comments associated with the URL object located at data-href. Your comment may also appear on Mugo Web’s Facebook Page. This comment will also be posted to mugo.ca. The Facebook scraper parses every URL into an internal og_object. For instance, https://graph.facebook.com/https://www.mugo.ca reveals that “https://www.mugo.ca” is represented by the og_object id 678293832262175. This link between the URL and an internal Facebook object is a permanent one. The very first time a comment box is rendered for an og_object, the Facebook SDK checks to see if all the conditions of Comment Mirroring have been met. If they have, Comment Mirroring is permanently enabled for that og_object. Otherwise, Comment Mirroring is permanently disabled. There is no way to change this setting once it has been set. This process happens in a black box and is entirely undocumented. Post the page to your Facebook Page. 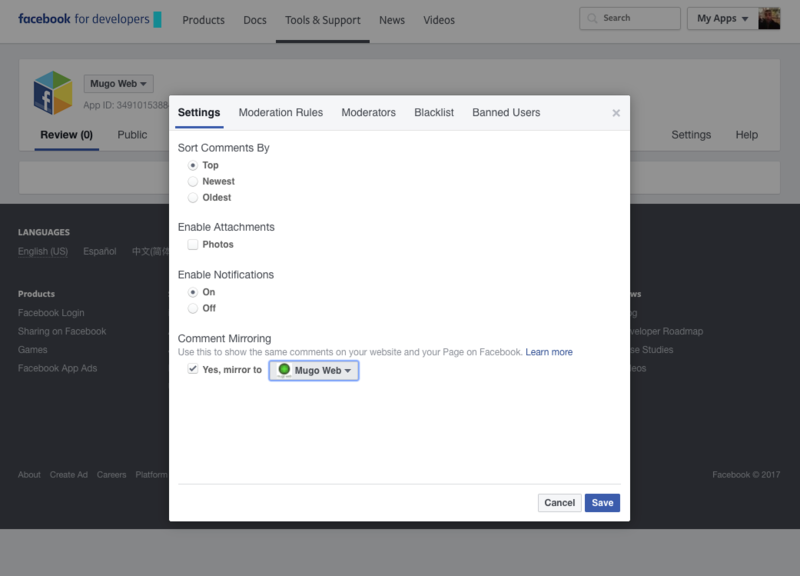 The steps detailed in the “Embedding Facebook comments on your web page” section bypass some of these limitations by manipulating the Facebook parser’s behaviour. 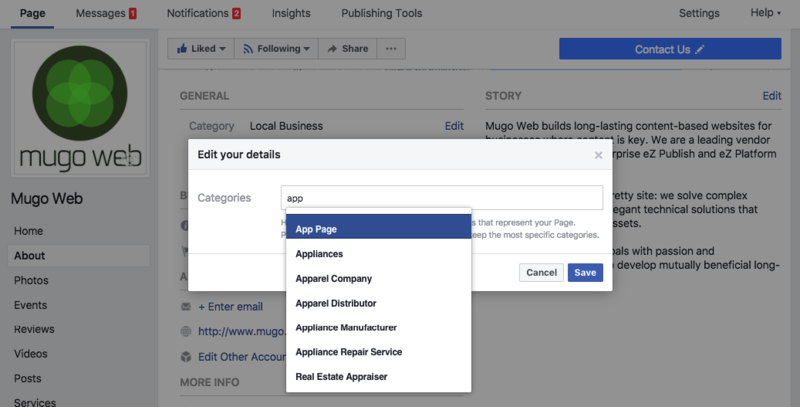 By appending “?fbpage=mugoweb” to the URL, and setting the resulting address as the page’s og:url and the comment box’s data-href tag, we’ve avoided a permanent link between our base URL and a black-boxed Facebook comment box instance. This means that if we decide we’d like to mirror our page to a different Facebook page, or to disable mirroring altogether, we can do so simply by changing the appended query parameter to the og:url and data-href, which would result in the creation of a new og_object. If you’re already using Facebook comment boxes and have an active Facebook presence, Comment Mirroring is a worthy addition. But even if you prefer your existing commenting platform, don’t miss the opportunity to creatively link your engagement channels. For instance, instead of the generic Facebook Page Plugin that indiscriminately displays recent posts, you could opt for the Facebook Embedded Post Plugin, which displays the engagement metrics (likes, comments, and reshares) of a single post. By showing readers how many people liked or commented when you shared an article on your social media channel, you create a natural cross-channel bridge that is likely to be compelling to your audience. Though this post was focused on Facebook, social engagement occurs across many platforms, each of which comes with a unique set of tools and considerations. At Mugo, we’re in the business of providing highly catered solutions that target the specific needs of our clients. Do you run a content-driven website? Have you maximized your engagement potential? Contact us for a free assessment!